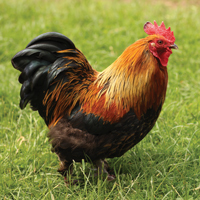 Soldiers, returning from China, brought the first Cochin bantams to England in the 1860's. 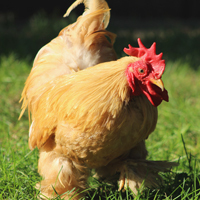 They were known as "Pekin" bantams then and are still referred to as "Pekins" in many parts of Europe today. 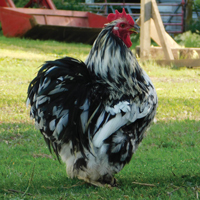 Cochins are heavily feathered down the shanks and toes and appear to be much larger than they actually are. They are very gentle, excellent setters, require little space, and with their many color varieties are absolutely beautiful to look at. 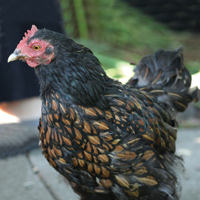 Cochins are the most popular of the feather footed legged bantams and one of our best sellers. A very popular variety that has a very soft golden buff color throughout. One of the oldest and most established varieties of cochins. 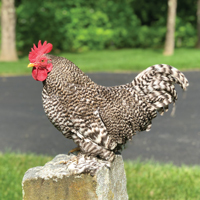 Accepted into the shows in 1965 the Barred Cochin is somewhat of a newcomer. To many people the barred variety is extremely pleasant to look at with its defined parallel bars of alternate dark and light colors throughout the length of each feather. The male's saddle and hackle feathers are a rich, brilliant orange-red which when combined with the greenish black body makes for an extremely attractive bird. The female is feathered with a glossy mahogany brown feather penciled in black. A very popular Cochin. 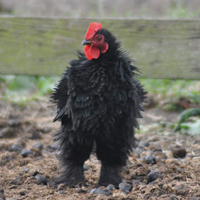 Cochins have a lustrous, greenish black base color with many of the feathers tipped in white - a color contrast that really makes them stand out in a flock. The entire surface of both the male and female should be an even shade of deep lustrous red with the males head, neck, back, and saddle appearing very rich red in color. 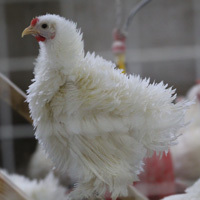 White in color, with feathers that curve outward and forward that give a frizzled appearance. Each feather is rich, golden-bay laced with lustrous greenish-black creating a broad oval with a golden bay center. Extremely eye catching. Black in color, with feathers that curve outward and forward that give a frizzled appearance. 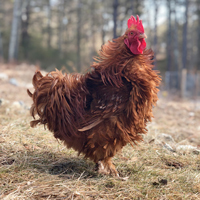 Red in color, with feathers that curve outward and forward that give a frizzled appearance. 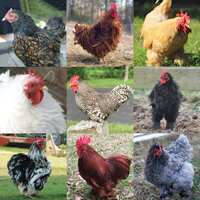 A wonderful selection of all Cochin bantams. Our choice of at least 4 different varieties. 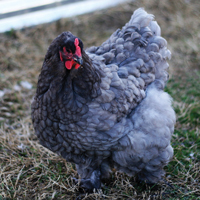 The true blue color is perhaps one of the most difficult colors to breed for in the poultry world. We have a nice blue that will vary from a bluish white to a beautiful black laced dark blue.